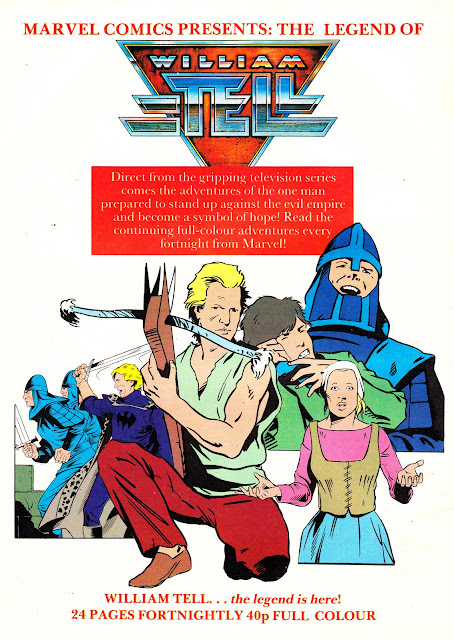 This is a Marvel UK house ad (from February 1989) for a new comic that never happened: WILLIAM TELL. The comic would have been based on the late eighties multi-national TV action/ adventure show CROSSBOW, which aired (over the summer of 1989) as William Tell on ITV in the UK. I don't remember seeing the series, although the scant information about it online makes it sound like it might have been fun. This ad shows that the decision to nix the launch must have come at the very last minute. Marvel were obviously (briefly) confident that this was going to be big. The regular comic might have been scrapped pre-launch but the material already prepared was diverted to THE MARVEL BUMPER COMIC (I've looked at that anthology in a previous post, follow the link below) and a one-shot William Tell Special. All these British-produced strips were also collected into a graphic novel. Marvel also published a William Tell Annual, which featured more British-produced strips along with text stories and stills from the show. Quite why Marvel UK put so much faith in the show is unclear, although it's possible that they planned (and probably did) to syndicate their material in countries where the series made more of an impact. I've got copies of all of the above so I'll run them here once I've unearthed them again. 1978: MARVEL COMICS INDEX issue 7B.